The end of growth doesn’t have to mean the end of prosperity, not if we spread wealth more evenly and re-evaluate our perception of prosperity. The good news is that happiness isn’t directly dependent on material wealth, as my following two charts show. Various surveys over recent decades have come to the same conclusion; that once we attain a level of wealth sufficient to live on, with enough money to keep us out of poverty, then increasing our income further doesn’t necessarily increase our happiness. 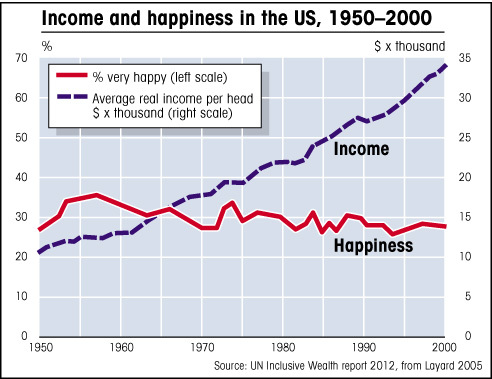 In fact, as my next chart shows, happiness can actually fall as income rises. This is because our expectations increase along with our wealth; the more we earn, the more we want; the less easily we are satisfied. And as we try to maintain the high income to which we become accustomed, the higher our stress levels rise. Most studies into the relationship between income and happiness, or wealth and well-being, have shown little correlation between these two important aspects of life, but they have shown a significant correlation between income equality and happiness. 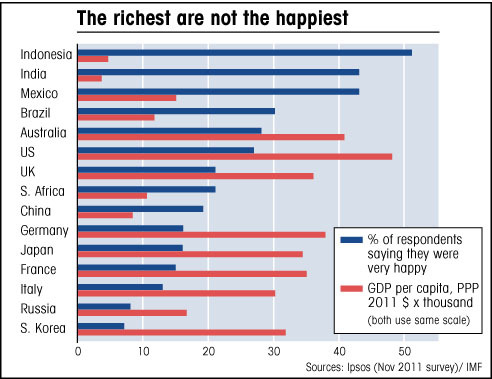 As the above chart shows, some of the poorest countries have some of the happiest people, just as long as the wealth is spread reasonably fairly. Obviously there are other factors one must take into consideration, such as climate and culture and the way people respond to such surveys, but the important point as far as this investigation is concerned is that a reduction in average incomes doesn’t have to mean a decline in well-being, and if such a reduction can be accompanied by greater equality, could even lead to greater happiness. The key is how reality conforms to people’s expectations, and expectations increase with wealth, often more than the actual standard of living. Once certain basic necessities are provided for, greater income leads to greater aspirations, and these aspirations often become unrealistic; our satisfaction relative to spending decreases. It is likely also that the kind of people who aspire to more are also the types who are less easily satisfied. As we become wealthier we also become more concerned with our place in society; we compare ourselves to others, and of course there is always someone around the corner who is apparently better off than us; the grass is always greener on the other side of the fence, as it were. We resent the rich flaunting their wealth, reminding us how unfair life can be. But we shouldn’t envy them – they are probably dissatisfied with their own lives anyway. And as the Stoic philosophers of ancient Greece and Rome understood, there is no point in worrying about all the aspects of life over which we have no control. Better to heed the advice of Seneca: If what you have doesn’t satisfy you, then however much you possess, you will always be miserable. Or better still, Epictetus, who pointed out that the best way to achieve happiness is to lower one’s expectations until they meet with reality. Cause and effect are not obvious when it comes to such a vague concept as happiness, but the evidence suggests that equality is much more important than outright wealth, at least in monetary terms. Prosperity is linked to other things besides money; health, relationships, environment, work – unemployment is one of the biggest causes of unhappiness, not surprisingly. 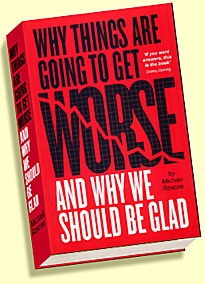 Another advantage to redefining prosperity is that all the arguments against higher taxes and greater regulation of finance and so on – that we will discourage free enterprise by limiting the motivation of entrepreneurs to create great wealth, etc – these arguments lose what little credibility they might have had, once we accept that growth is no longer desirable, that in fact we need to cut our consumption of resources anyway. The big challenge now is how to improve our living standards in more subtle ways than simply consuming more and more of the world’s finite resources and warming up the world, threatening to wipe out humanity in the process. While it will still be desirable and even essential to encourage investment in real industry, and also to encourage entrepreneurs to find solutions to problems through technology, we shouldn’t have to rely on the motives of self-interest and greed. So what we find is that several of the problems we’ve identified – problems linked to the decline in real jobs and the rise of the financial sector – can be tackled by reducing the ratio of finance to real industry. This gives us some hope, because governments can do something about this through policy initiatives, beyond the obvious actions regarding the tightening of bank regulation. For example, by directing investment towards public housing and therefore reducing rental and mortgage costs, the government can help to free up more lower and middle-class earnings for other purposes, while at the same time reviving the construction industry, which is less affected by productivity improvements than most industries, and is therefore likely to become more important as an employer. Despite the fact that recent policy in some developed countries, the UK especially, took the opposite viewpoint, there is no good reason why the government shouldn’t be involved in the business of ensuring that everyone has a place to live. It actually makes a lot of sense for the state to provide affordable housing, as many European nations do and as Britain did before the rise of the monetarists and the financiers. It is hardly coincidental that house prices have risen so much in the UK while the stock of local-authority housing has fallen, as shown in Figure 115. Such state involvement doesn’t have to be heavy handed or bureaucratic; the public sector can oversee the process at a regional or local-government level, while contracting out the actual building work to the private sector. The cost of housing can be brought down and lower-paid workers will have more of their income to spend on other things. At the same time, construction jobs will be created, and because construction is a productive industry that is not too dependent on oil and uses resources that are not in danger of depletion*, this is an area, along with the related business of providing public utilities such as power, water supplies and more efficient transport networks, where it is particularly helpful to create employment. We can also tie this policy in with our other major initiative besides job creation, because the government can ensure that the new housing is built to the latest energy-efficiency requirements, with higher standards of insulation, solar panels on the roof, geothermal heating, efficient appliances and so on. It can also be built on land that has no other use, such as old industrial sites or other ‘brownfield’ areas, within urban boundaries that are served by extensive public transport. In addition to this new construction, local authorities could instigate a program for the upgrading of existing buildings to the latest standards. The construction boom of the post-war era, as illustrated by Figure 115 (for Britain, but which also occurred in the rest of Europe, as well as in the US and elsewhere), was not just a result of rising wealth; it was a key component of that wealth; part of the virtuous cycle; cause as well as effect. Construction creates real jobs and real wealth, so as long as there is a need for the buildings (unlike in Ireland and Spain during the last boom, for example) it should be encouraged. There are many such improvements that could be made to the infrastructure generally with more imagination and more commitment from governments; some genuine leadership from people who aren’t afraid to upset the establishment by directing investment to something useful and productive in the long term, rather than printing money to give to the bankers. The state sector could make use of its ‘reserve army’ of unemployed workers to do much of the work, without worrying so much about the cost, and this brings me to another idea regarding employment policy.